Design an iPhone game. Track Santa’s movements. Animate text. Those are just a few of the ways students can participate in  Computer Science Education Week , which is Dec.  3-9. 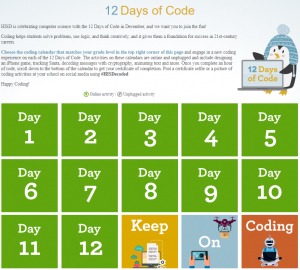 The HISD Instructional Technology team has shared the 12 Days of Code with an activity board  that allows students to engage in a new coding experience every day. This entry was posted in News, STEM and tagged 12 Days of Code, coding on November 29, 2018 by HISD Communications. Hundreds of HISD employees participated in a Coding Bash and Technology Showcase at Hattie Mae White Education Support Center on Friday, Dec. 8, in support of Computer Science Education Week. 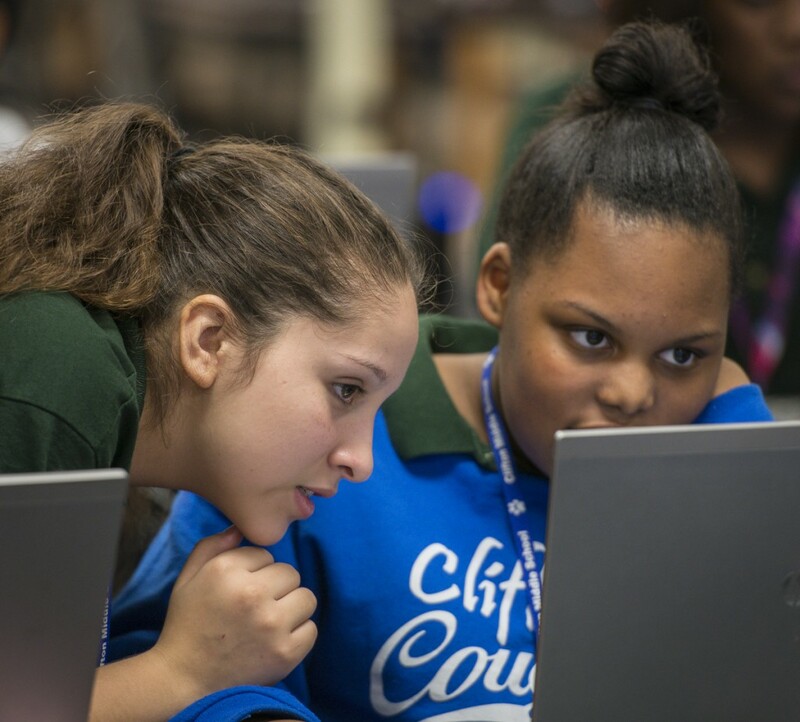 Microsoft and HISD’s Advanced Academics Department partnered on the event, which demonstrated the importance of coding as a way to develop critical-thinking and problem-solving skills. The district is leading by example to show students, teachers, and staff members that coding impacts everyone. This entry was posted in Career/technical education (CTE), Global Education and tagged Advanced Academics, coding, Hour of Code, Microsoft, Worthing HS on December 8, 2017 by HISD Communications. On Saturday, Dec. 3, HISD Advanced Academics and the STEM Teacher Development team hosted “Crack the Code: A Coding Challenge Day” with HISD students to kick off Computer Science Education Week, which is Dec. 5–11. Students and teachers from 27 district elementary and middle schools participated in the challenge day, which was held simultaneously at two locations – Southmayd and McGowen elementary schools. This entry was posted in Advanced Academics, STEM and tagged coding on December 5, 2016 by HISD Communications. Did you know you could program a computer to play a piano using fruit or PlayDoh as a conductor? That’s what teachers and students learned at a “Crack the Code” event held Jan. 9, at HISD’s Southmayd Elementary School. Sponsored by the Innovative Curriculum STEM Teacher Development team and funded through the TIF4 STEM grant, “Crack the Code” created an opportunity for teachers to develop coding skills and explore new ways to implement coding in their own classrooms, even when they don’t have computers available. More than 200 students, teachers, and parents participated in the event, which offered a variety of coding activities — both plugged and unplugged — in an exciting day of challenge and learning. Teachers participated in the learning right along with their students, as they worked their way through the station activities. From creating obstacle courses and navigating mazes to working with Scratch programming and physical computing, participants expanded their coding skills and understanding. Managed by the Office Innovative Curriculum and Instruction in partnership with the Department of Research and Accountability, the TIF4 STEM grant is a five-year federal grant in its third year of implementation. The grant provides program support to 23 schools: 18 elementary campuses, three middle schools, and two K-8 campuses. See more footage of students and their project in the #HISDecoded Twitter feed. This entry was posted in News and tagged coding, computing, HISDecoded, programming, Scratch, Southmayd ES, TIF4 on January 14, 2016 by HISD Communications. The Innovative Curriculum department will hold its first ever invitational coding event for its TIF 4 STEM grant schools on Saturday, January 9, 2016 from 9 a.m. to noon, called “Crack the Code.” Students, teachers, and chaperones from 18 of the grant’s middle schools and elementary schools will convene at Southmayd Elementary School, the host campus, for the day’s festivities. Over 200 people are expected to participate in the day’s coding activities. A unique aspect of this event is that participants will learn, test, and refine their coding skills alongside each other, highlighting the ability of students and teachers to be co-constructors of STEM-based knowledge and skills. The purpose of the invitational, is to serve as a “pilot” coding event for HISD. Any business entities, philanthropic organizations, or non-profits interested in helping to support the vision for a district-wide coding event in the future, should contact Annie Song in HISD’s Strategic Partnerships Office at 713-556-7218. Current funding provided by the TIF 4 grant supports the TIF 4 STEM team, responsible for leading and preparing the day’s activities, busing to the event location, and recognitions for all participants. This entry was posted in Science, Special events, STEM and tagged coding, Hour of Code, innovative curriculum on December 10, 2015 by HISD Communications. Hour of Code is a global initiative that calls for students to do at least one hour of coding during Computer Science Education Week, which runs from Dec. 7 to 13. Basically, coding is typing step-by-step commands into the computer that tell it what you want it to do. When coding, also known as programming, students will use language that computers understand to create computer games, applications, web content, and much more. This entry was posted in Global Education, News, Science and tagged coding, Computer Science Education Week, Herrera ES, Hour of Code, programming on December 3, 2015 by HISD Communications. Critical thinking is a key part of HISD’s Global Graduate profile. That’s why students from 59 HISD schools are taking part in a worldwide challenge that introduces computational thinking through online challenges. This entry was posted in Global Education, News, Science and tagged Bebras, coding, computational challenge on November 13, 2015 by HISD Communications. 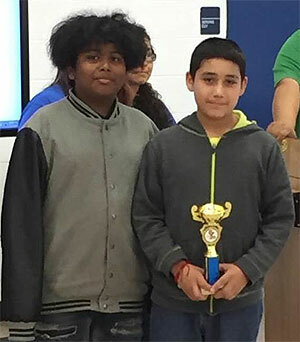 About 50 teams of students from various HISD elementary and middle schools came together on the campus of Hamilton Middle School May 2, and all were eager to test their mettle as coders in the school’s inaugural “Scratch Off” contest. Named in honor of the free programming language developed at the Massachusetts Institute of Technology, the competition challenged students to complete 20 tasks using Scratch, such as making an animated character called a “sprite” change color or move in particular ways on the screen. This entry was posted in Achievement/Recognition, District I - Elizabeth Santos, District II - Rhonda Skillern Jones, District IV - Jolanda Jones, District V - Sue Deigaard, STEM and tagged coding on May 6, 2015 by HISD Communications. Students at Kolter Elementary School cheered and posed for pictures alongside a $10,000 check from Code.org that will go toward purchasing new laptops after the school won the nonprofit’s Hour of Code registration challenge. Kolter was selected as the Texas school winner along with 50 other schools that were named the winners for their state. This entry was posted in District IV - Jolanda Jones, Elementary Schools and tagged coding, computer science, Kolter ES on December 11, 2014 by HISD Communications. Approximately 107 HISD schools have registered to participate in the Hour of Code as part of Computer Science Education Week, Dec. 8–14. The week-long global initiative encourages students of all ages to learn the basics of coding, engineering, computer programming, and gaming. This entry was posted in 21st century schools and tagged coding, Computer Science Education Week, Hour of Code on December 8, 2014 by HISD Communications.